The Kazakh Olympic team is hoping to boost its chances of sporting success at London 2012 with horsemeat sausages, specially shipped to the UK. 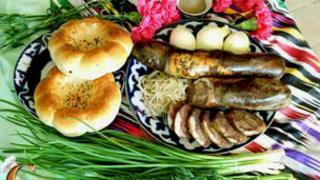 Sports officials in the Central Asian country say that the traditional dish may help the athletes' performance. But it is unclear whether the sausages will be allowed into the UK, because of strict import controls on meat. Kazakhstan is fielding 114 athletes at the London games, which begin in two weeks. The BBC's Shodiyor Eshaev in Almaty says horsemeat is an indispensable part of the traditional Kazakh diet, and a dried horsemeat sausage known as "kazy" is particularly cherished. The Kazakh team is made up mainly of boxers, wrestlers and weightlifters, all sports associated with a protein-rich diet, our correspondent says. "We'll bring horse meat and caviar for each team," sports official Elsiyar Kanagatov said, adding that athletes could achieve "outstanding results" if fed properly. Oil-rich Kazakhstan is fiercely ambitious and there is also the promise of hard cash should athletes succeed - $200,000 (£129,000) for a gold medal, $150,000 for silver and $75,000 for bronze, our correspondent says. The team has won 39 medals including nine gold since its debut at the Olympics in 1996.